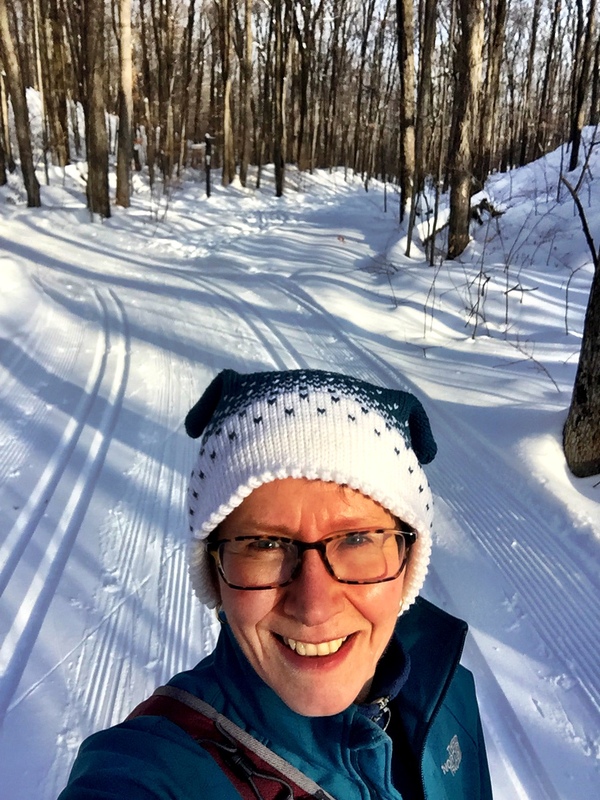 I could not resist that title, which came to me while I was out skiing today - in my new hat (proof at left). These are both machine knitting projects made on my LK 150, a mid-gauge machine. 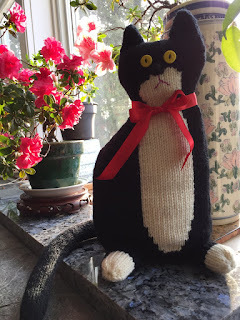 I made the cat (Ravelry link) for a friend, who sadly lost her black and white friend very suddenly in early December. I used a free hand knitting pattern found on Ravelry (The Window Cat). "Using" the pattern means figuring out the shaping and adapting it for my gauge. I knitted the back first since it is plain black, to check the general shape and size. 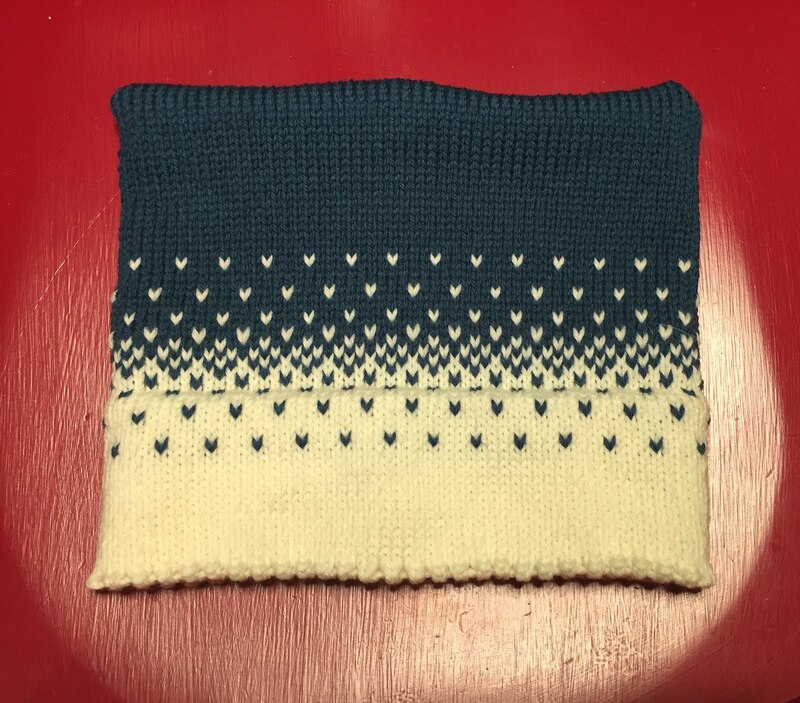 The front is identical shaping but with intarsia to match the colouration of the inspiration cat. 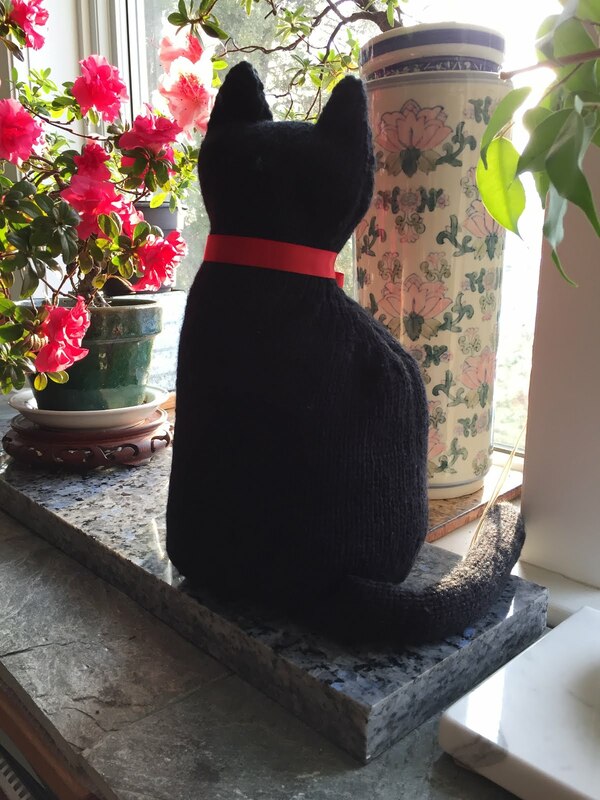 The paws and tail were straight knitting on just a few stitches, and his base is essentially a rectangle. Yellow button eyes give him that baleful look cats so often have. I was very pleased that he came together so well. My friend was able to find a real kitten to fill the hole left by Albert. 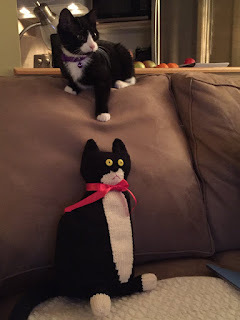 He was not very curious about his knitted predecessor, but did consent to be photographed with him. For quite a long time I've been thinking I should really use some of my (ahem) extensive yarn stash to knit myself a ski hat as the one I was using did not compliment my jacket at all. With the machine this very simple hat was (or should have been) a super fast project as it is just a rectangle (Ravelry link). 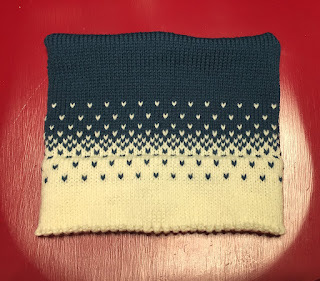 I used the chart from this pattern, calculated size based on the circumference (21" more or less) and height (8" more or less) of my commercially knit hat, and started to knit. But I had to make it 3 times since I was doing the planning on the fly. My first attempt, I used the hem and patterning dimensions from the pattern. Too much white. I decided to knit a narrower band of white and start the stranded pattern inside the doubled hem (which is knitted on every other needle). I still finished by bedtime, having purchased the white yarn that afternoon. The consensus among my skiing buddies is that I should make tassels and attach them to the corners (which want to turn down anyway). So it is still technically a WIP even though I have already worn it twice. It's lovely and warm and looks pretty good with my jacket.